Once a campground for Indians (within present-day Brackenridge Park), the headwaters of the San Antonio River begin here on the grounds of Cathedral House. Alamo Heights was included in the original survey of the city of San Antonio in 1836. 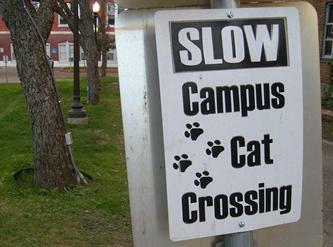 The following year a city ordinance autioned off city land to fund city improvements and infrastructure. Although it was bitterly contested, the site was sold and was eventually bought in 1869 by Mrs. Isabel Brackenridge. 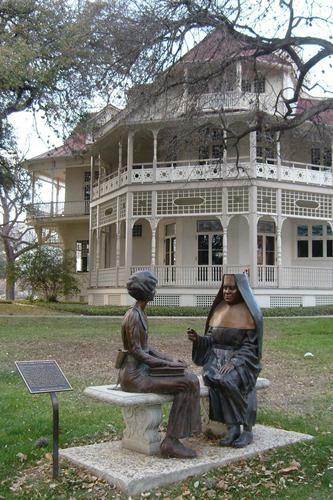 Her famous son, George W. Brackenbridge sold the family estate in 1897 to the Sisters of Charity of the Incarnate Word. The former Brackenridge Family estate, Fernridge, is maintained as a museum by the sisters. Incarnate Word College sits on the line that divides San Antonio and Alamo Heights. 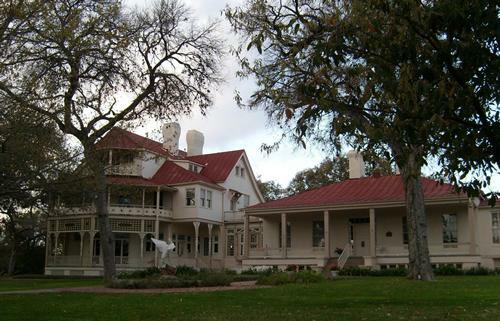 The Argyle Hotel, another local landmark, was originally a ranch headquarters, built by Charles Anderson in 1860. After undergoing several sales, the land was eventually developed. 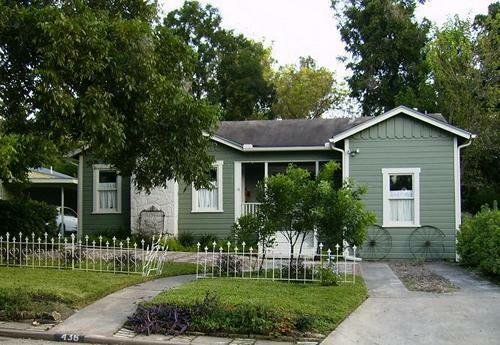 In the early 1920s, the city of San Antonio vigorously tried to annex the Heights, but failed. 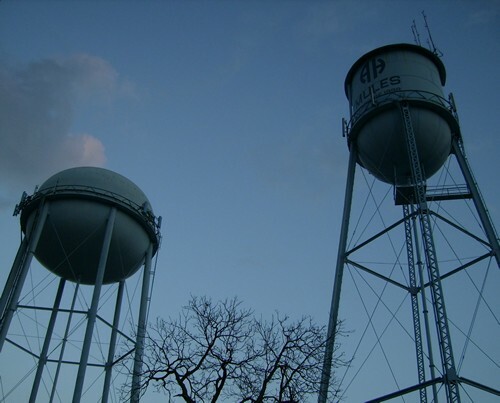 In 1922 Alamo Heights became an independent municipality. The population reached 7,950 by 1950 and declining to 6,933 for the 1970 census and returning over 7,000 mark to 2000�s 7,319. 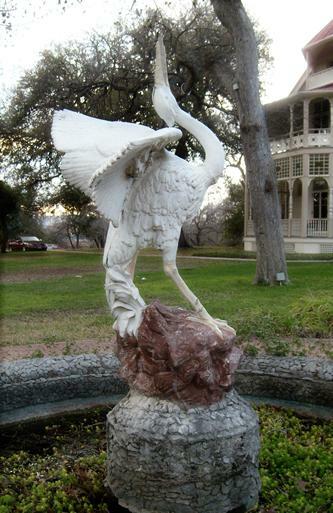 The statue was purchased around 1900 by George Brackenridge to be the garden centerpiece for the family estate. The former Mobil station on the corner of Broadway and Austin Highway has always been a landmark. 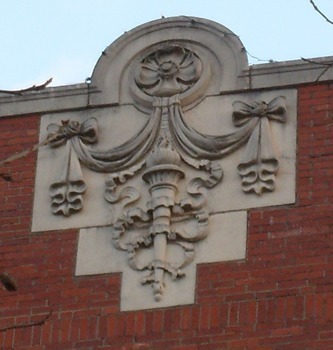 It was one of four built north, east, west and south of downtown by the Magnolia Oil Company. 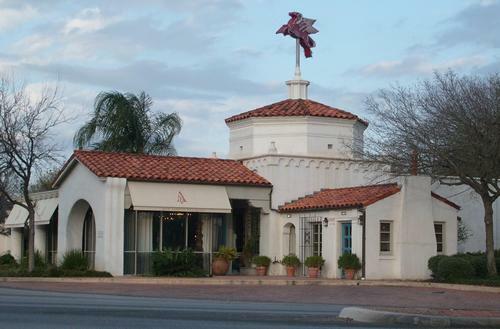 When the gas station went out of business the famous Flying Horse was saved, and the location has been leased by a number of different businesses, including a florist, realtor and a interior design company. 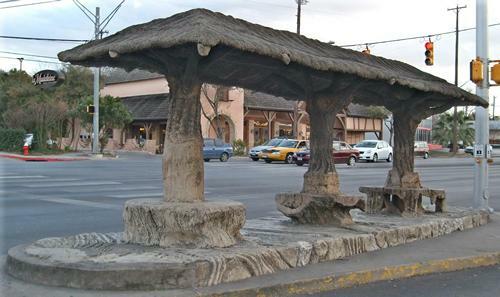 Called San Antonio�s �most accessable work of art� by Mark Rybczyk, author of San Antonio Uncovered, this unusual structure was a gift of the Alamo Cement Company to the city of Alamo Heights in 1931. Dr. Aureliano Urrutia employed Rodriquez at his estate and it was the doctor who introduced him to Chas. Baumberger Sr., who founded Alamo Cement. 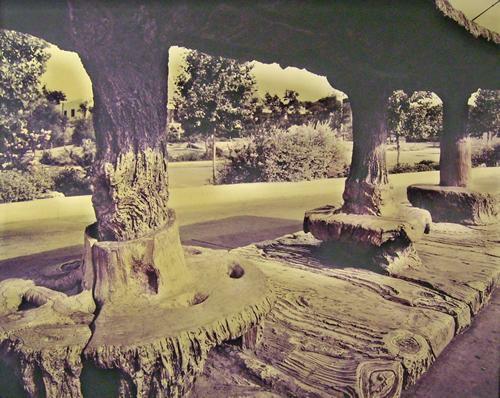 The Gate to the Chinese Sunken Garden in Brackenridge Park was also a work by Rodriquez as well as a fish pond / fountain and fence at the Alamo Cement Company headquarters. Rodriquez� tool of choice was a simple dining fork and his medium was cement. The process was kept a secret, that some say died with the artist in 1955. Dionico Rodriquez worked where his commissions took him. From Mexico City to New York City and some out-of-the-way places (Hot Springs, Arkansas and Memphis, Tennessee) between those two monumental bookends. 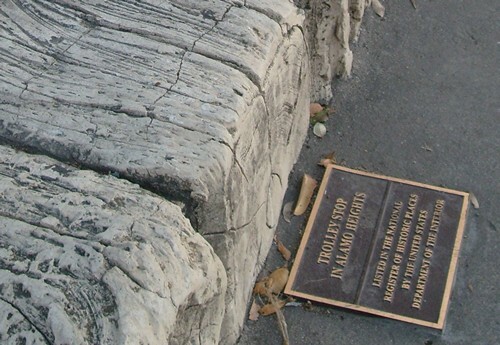 The trolley / bus stop is now listed on the National Register of Historic Places. 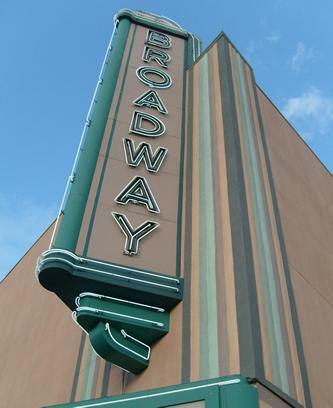 The Broadway Theatre was turned into an office building 25 years ago, but the sign remains as a local landmark across from the trolley stop. A seated statue of George Brackenridge is displayed at the entrance to Brackenridge Park at Funston Place at 3501 Broadway. Designed in the 1930s, it sat as a plaster model for years. After Pompeo Coppini�s death his adopted daughter, sculptress Waldine Tauch got permission from the mayor of San Antonio to cast the statue, and it was sent to Italy. A controversy over the contract not being signed resulted in Tauch getting stuck with the $30,000 bill. 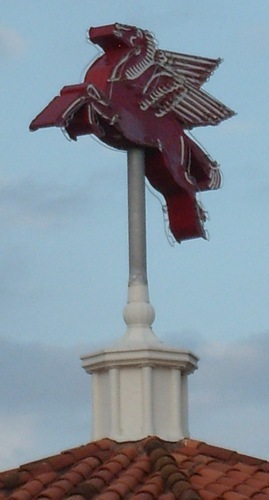 Funds were raised and in 1970, the statue was finally set in place. 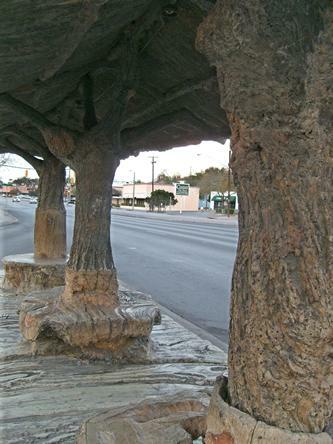 Information from A Comprehensive Guide to Outdoor Sculpture in Texas by Carol Morris Little.